Hi I'm Jamie and I'm going to show you how to replace the base on your PJN3 unit. To do this we are going to need some tools. I have a 7/16 wrench, I have a Phillips screwdriver, you can also use an electric drill with a Phillips bit in that. I have a 7/16 socket on a pneumatic impact wrench, you can also use a ratchet and a socket as well, and a drill with a 13/64 drill bit. Now to get started we are going to drill out the rivet holding the top of this door check cable. So we just simply place the rivet in the middle like that and I like to apply a little pressure on the cable to prevent the rivet from spinning as you drill it out. And save this washer because you'll be reusing that. Now we are going to start by placing the unit on its rear panel and opening up the door and then taking your Phillips bit and your 7/16 wrench, you are going to simply unscrew these screws and remove them. Now as you are pulling out this last screw you want to save all of your bolts and your washers and the nuts and place them to the side. Also, if your unit is older you may have a slotted screwdriver instead of a Phillips so keep that in mind. Now we have our bolts and nuts and washers and place them to the side and we will take our impact and get these lag screws out all the way around the perimeter of the base. Now you'll see on this unit, this is a PJN3 unit and had the PJN3 tank. Now the N3 tank came out in the year 2000 and that was a little bit narrower than our old tank. If you are replacing a base on an older unit, that can be done, you'll just have to order a PJO30001R, that's the part number for the base complete with the floor. If you are replacing the base on a PJN3 unit. that would be PNJ30001. Now you'll notice that I didn't drill out the rivets for this tank. We are going to be able to lift up the shell with the tank in it. If you wanted to replace your tank with your new base on your older unit you could simply replace your tank as well and put a new base in there which is the PJN3 part number. Now what we will do is lift the shell off and tilt the shell off the base and put our new base in place and tilt the unit back. And just replace the base with the new one. With our new base in place we are going to take our shell and we are going to lift it up on the back of the base here. Do the same thing for this side, like so. And ideally what will happen is we will tilt this up and it will go right on the base. Now let's get our jam bolts put in place first. Now we put our jam bolts back into the jam, and into the base, so we just simply put the whole bolt in the jam and lift up on the jam and line up the hole. And we will do that for all 4 bolts. Now this last one, it might be tricky to get by this hinge so sometimes it's helpful to have a little screwdriver and run it through, like so. Now take our unit and we are going to tilt it back. And we will get the nuts and washers from the back side of the bolts. Now when tightening these up, don't get too carried away because you could draw the washer through the plastic, just get them until they are pretty snug. If you need to replace this bolt this is a PC000174 bolt and then there is a washer on the back side that is a PC000123 and a nut that is a PC000140. Now we are going to close the door and we will get this unit back upright. Now before we install our live bolts into the unit we are going to shim up the back corners with a 1/4" shim and you place that between the back of the side panels and the top of the runner here, not on top of the raised area on the end of the runner. Using our impact with out 7/16 socket we are going to reinstall our lag screws. When installing these it is very important to not over-tighten then as you strip out the plastic and they become worthless. Just go until they get snug, just like that. Now we are almost done, we just have to put our door check cable back in place, we will do that using a PC000104 rivet, we are going to reuse the PC000168 washer and also with a new PC000106 back-up washer. We are going to put the rivet through the jam, place the loop of the cable on to the end of the rivet, then place the 2 washers and rivet in place. Now if you get all your lag screws in make sure you pull all of your shims out and you are finished. 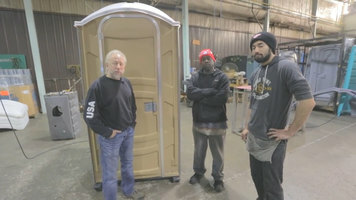 Now if you'd like any more information on how to fix any other parts of your toilets or if you'd like any more product information about our units please visit our website and I thank you for watching. Get a step-by-step walk through on how to replace the base on your PolyJohn unit. There's no need to struggle with complicated manuals when this video quickly and simply explains the process in detail for your convenience! Get step-by-step instructions on how to replace the screens on your PolyJohn unit. Once you see how it is done, the screen replacement process is sure to be quick and easy. 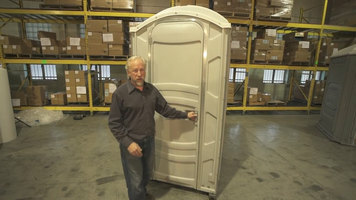 Get a unit you can rely on with the PJN3 portable restroom from PolyJohn! See all the standard features that come with this unit to make your experience the best possible. 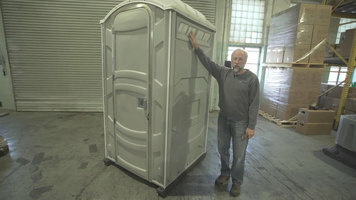 A comprehensive step-by-step guide on how to assemble your PolyJohn PJN3 portable restroom. Note: this unit ships assembled.